At Stay Able we understand barriers to safety and accessibility to independent living. Our custom made to measure Handi- Glides is manufactured in Surrey, British Columbia. 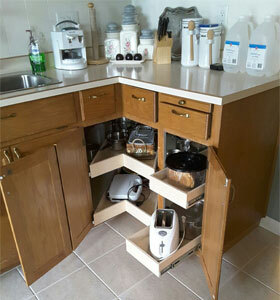 It can transform out dated kitchen base cabinets and pantry into easy access drawer space and storage. Its ideal for converting unwanted broom closets into beautiful built in pantry for much needed accessible drawers space to replace unreachable wall cabinets. Our custom made to measure Handi - Glides is constructed using cabinet grade plywood for sides and bottom for durability and beauty. The hardware is full extension for maximum access with 100 lbs weight test. Our custom made to measure Handi- Glides come in clear coat finish or painted white. Call today for a free no-obligation consultation with one of our trained staff.